Any word on Boonesville? Normally someone posts info on conditions, running order - etc. The National Amatuer Championship finished Monday. Champion is Llanos Big Bad Betty - Inderman owner/handler from brace 5. 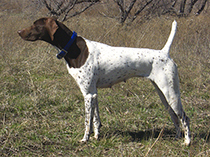 Runner-up Champion is (our dog) Jagermeister's Dollop of Daisy -Joe Orndorff owner/handler from brace 15 . 30 dog event. This is Daisy's 3rd National Placement in a year. She was named Champion last year in Booneville at the NGSPA Open National Shooting Dog Championship..then went Runner-up at the NGPDA All Breed National Shooting Dog Championship in Pinkneyville,IL. We are very proud of her to say the least. The Futurity started today and will end tomorrow and then the All Age will start. Dear Lord, Please make me the kind of person my dogs think I am. Futurity ended yesterday. I don't have the names of the dogs or owners. I know that a Gulledge handled dog came in 1st & 3rd. A Goegan handled dog came in 2nd. If I find out the names, I'll add them in. The All Age began today. 10 braces scheduled with the 10th being a bye brace.19 dogs total. Should end tomorrow sometime. 2nd Place - Jokes On You owned by Steve Erickson and handled by Chris Goegan. Thank you to those who post the updates And big Congrats to Jager !! Runner-Up - BDK's Chloe's Jax of All Trades. Owner: Brooks Carmichael. The 2016 NGSPA National Championships are over.